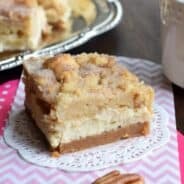 These bars are seriously one of the best desserts that have come out of my kitchen this year! Chocolate Oreo base topped with a white chocolate peppermint topping. 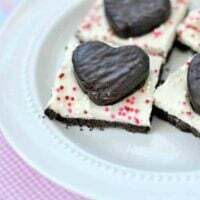 And of course, some cute Peppermint Patty Hearts for Valentine’s Day! Did I mentions this is a NO BAKE recipe?! Februrary is always one of our crazy months. Not because of Valentine’s day, but because swimming is coming to an end for the season. The month is always filled with extra swim meets, team dinners, and hungry athletes! It’s a crazy fun time to see how far my little swimmers have come in one season! And of course, I know the month of March is our time off swim before we start again in April. So I can deal with the crazy month knowing there is rest coming soon! But in the meantime, if I seem a bit absent this month, check out the pool, that’s where you will find me! These peppermint bars are so easy to make! I whipped them up one morning before my kids went off to school and I spent the whole day staring at them longingly. After making the crust, I whipped up the topping by combining some melted Vanilla Candiquik with softened cream cheese and peppermint extract. I may have spooned a few bites straight to my mouth at this point! Once I spread the cream cheese layer over the crust, I knew something was missing. As a last minute decision I added the Heart shaped Peppermint Patties and sprinkles. Seriously you guys, I wasn’t sure if this recipe would work, but it totally exceeded my expectations. The crunchy base is going to be seen again, I LOVE the way it turned out! I can’t wait to make another batch of these. Maybe next month I’ll make them GREEN mint for St.Patrick’s Day! For the crust, process cookies in a food processor until a fine crumb. In a microwave safe bowl, melt butter with chocolate morsels for about 90 seconds, stirring after every 30 seconds. When smooth, fold in crushed cookies. Spread mixture in the bottom of a foil lined 13x9 baking dish. Use fingers to get mixture to pack evenly in pan. Freeze for about ten minutes, while making the topping. For the topping, beat cream cheese about 2 minutes until fluffy. Add melted candiquik and peppermint extract. Beat for 3 minutes on high until fluffy. Spread over cooled crust. Immediately press peppermint patties on top of cream cheese layer and add sprinkles, if desired. 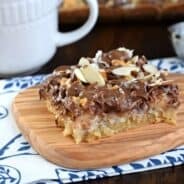 This looks like the perfect no bake recipe when you are in a pinch! I love love love peppermint patties! I love them too! And yes, no bake recipes are awesome! Omg these are so cute and easy to make! I definitely want to make them for Valentines Day! Thanks Shaina, let me know if you try them!! No bake and peppermint patties…I am so there! These are so cute and I love how easy they are! I love an easy recipe, especially when it involves peppermint patties! Thanks Kayle. yeah, I can’t get the base out of my mind either, it was sooooo good! 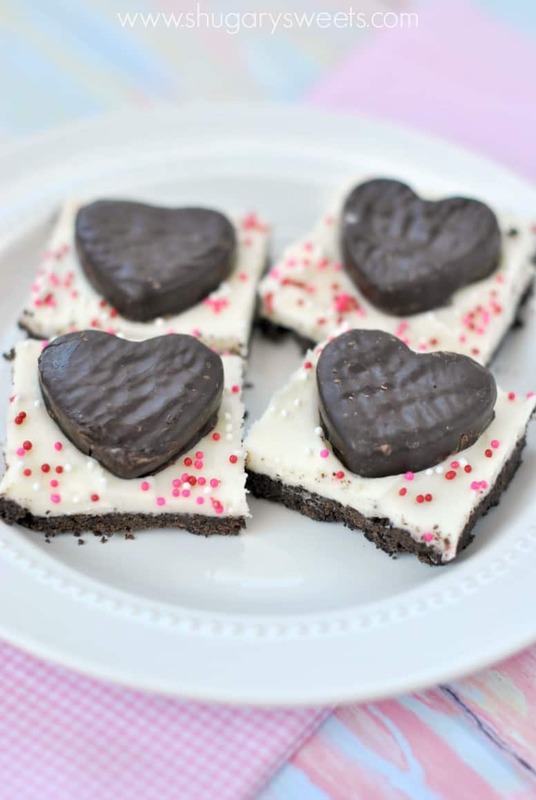 Would it work to use a heart shaped cookie cutter instead of cutting into squares? Love that you added the peppermint patties. Delicious! Oh I can taste the pepperminty goodness of these bars. And they are cute! Those look absolutely fantastic! Delish! That crust does looking pretty amazing!! 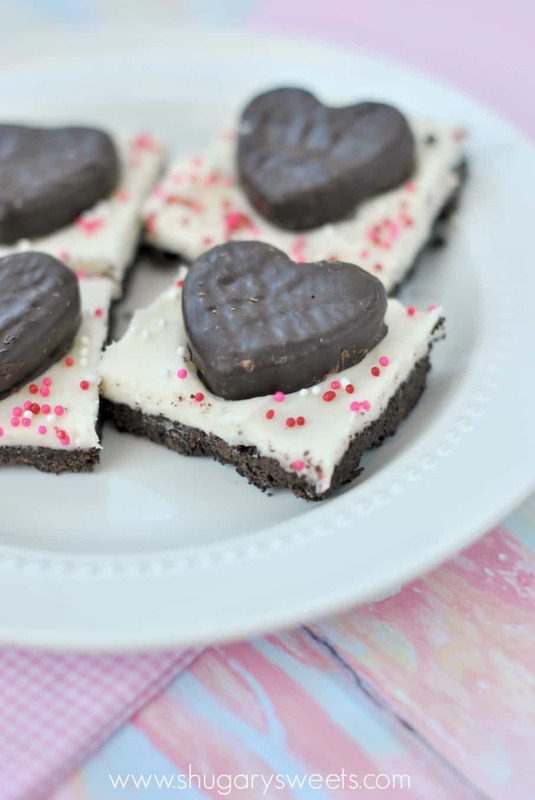 I think those heart peppermint patties are so cute and this is even better because it is no bake!! Love it!! Thanks Nancy!! You’ve got to try them…so delicious!! My husband would love these for Valentine’s Day! He loves peppermint candy! Pretty sure these just rose to the top of my must-make list! Oh so cute and perfect for Valentine’s Day! I bet the kids would love these! Thanks girl! Wish you were here to enjoy some! You know I can’t resist me some York peppermint patties! 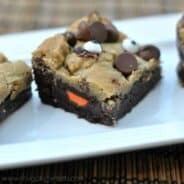 These bars are equal parts adorable and scrumptious, Aimee! These are too cute, Aimee! Can’t go wrong with the combination of chocolate and peppermint. Plus, I love the pink and red sprinkles you added to these. Pinned! Chocolate and mint are the perfect pair! 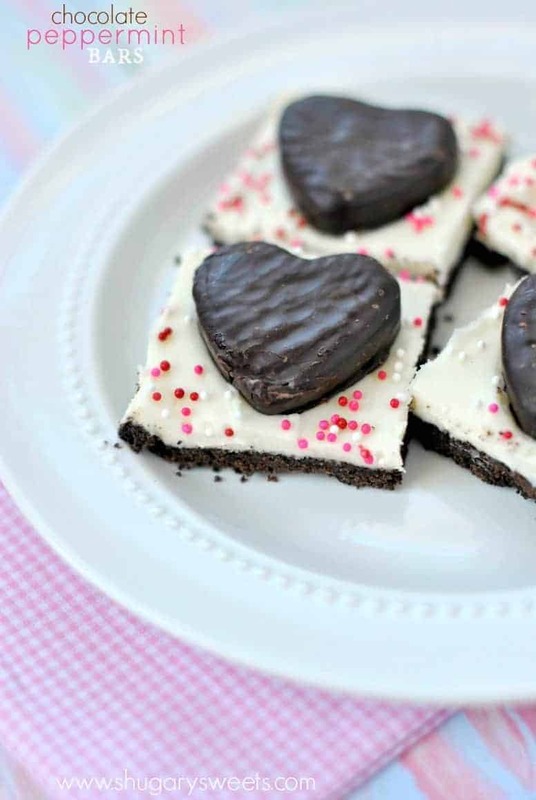 I love the heart shaped peppermint bars on the top! Thank you! They were a huge hit! No bake and delicious?!? Sign me up! Oh wow – you might see a version or two come out of this kitchen, too! Thanks for sharing – can’t wait to try these!